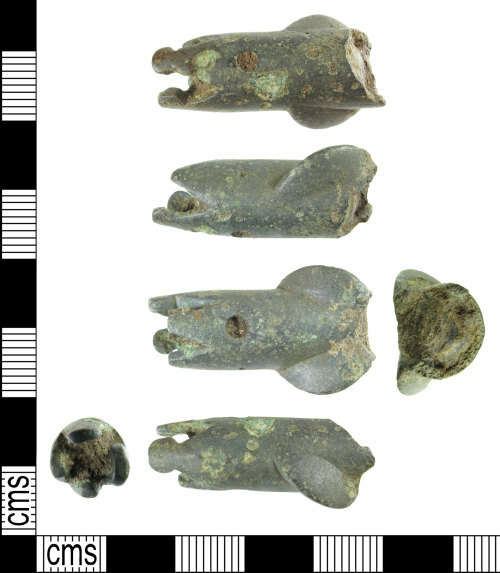 A copper alloy unidentified object of unknown date. The object is cylindrical but solid, at one end there are four triangular projections, two of which have rounded knops on the terminal end. Inside the projections is hollow, with traces of corrosion. In the body of one of the projections is a circular indentation, possibly a ring and dot decoration. Below this is a circular perforation, this is mirrored on the opposite side of the object. At the opposite end of the cylinder the object ends in a worn break. Either side of this is a half circular globular projection, projecting out like wings and running from the top edge to the lower edge of the object. The outside of the object has a mid green patina, on the inside of the broken end it is a dark red brown colour. It measures 29.1mm in length, 15.4mm in width, 10.1mm in thickness and weighs 10.02g.